Posted on January 12, 2013 at 1:38 pm. A few weeks ago I was sending a text with the word “canceled” in it. Even though auto-correct agreed with the spelling it just didn’t look right to me. I typed in “cancelled” and auto correct agreed again. Seeing as one of my biggest pet-peeves are misspelled words, I took to the internet to find the right answer. What I found was actually pretty interesting. I first asked Google to “define cancelled”. It gave me the definition. Then “define canceled”. It gave me the same exact definition. Google also recognized both spellings to be correct. After further research I found contradictory statements from so-called “professionals” article after article over which spelling was correct. I started to think about other spellings that were similar. A word that ends in a vowel + “l” will be changed into what? “boil” -> “boiled”, “fail” -> “failed”, “equal” -> “equaled”, “universal” -> “universally”. I also thought about other words… “split” -> “splitting”. Most examples seemed to indicate only one “l” was necessary but I kept finding contradictions. 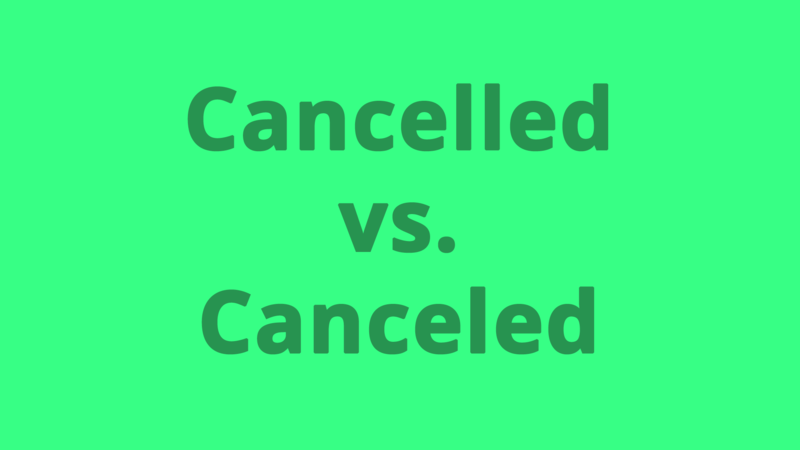 Why then, was “cancelled” still deemed correct? British-English frequency of the use of the words “canceled” and “cancelled” between 1800 and 2008. Although “cancelled” has been slowly but steadily increasing in frequency among British-English speakers, the word hardly existed prior to 1920. Looking at this graph you can clearly say that “cancelled” is the proper spelling for British-English speakers. But what about American-English? American-English frequency of use of the words “canceled” and “cancelled” between 1800 and 2008. While “canceled” hardly existed in American-English before 1840 it increased in frequency all the way up to 1985 where it surpassed “cancelled” as a more commonly used word in American literature. Between 1985 and 2007 “canceled” remained dominant but in 2008 “cancelled” became the more frequent term (when line smoothing is turned off). They are both right. Seeing as “cancelled” has been far more prevalent over the years, I would argue that it is the “more correct” spelling. It seems that people (incorrectly) adopt new spellings over time and then become the vernacular. I wouldn’t say that writing one less “l” makes it any easier, I would just say it’s wrong. A similar dilemma has been plaguing the words “traveled” and “travelled”, the latter of which has been phased out over the last hundred years and is now deemed incorrect. I, for one, will always spell cancelled “cancelled”.